Nouveau TV spot sur fb. Presque rien d'inédit. Official Game "Escape from Venice"
J'ai ressenti la même chose... J'ai presque eu envie de crier ! Rooaaaaaaaaaaaaaarrrrrrrr..
Merci tout le monde pour les liens vidéos! Leurs statues en cire des musées semblent plus réelles... mais je m'en fiche c'est magnifique de les voir ensemble en couverture!! Angie parle du bureau de JD qui est orné de ses peintures et photos de Vanessa et les enfants. Je suis désolée les filles , j'ai essayé de lire les grandes lignes sur 3 pages j'ai pas trouvé ce que je voulais. Surement que vous l'avez déjà annoncé mais je n'ai pas vu. Est-ce qu'il y aura une avant première à Paris où Johnny sera présent ou pas??? Je suis tellement excitée de voir le résultat! Je me suis posée la question plus haut dans le topic mais personne n'a de réponse pour l'instant. On sait juste qu'il y aura des interviews données à Paris mais on ne sait pas quelle date exactement (certains disent 1-2 décembre, d'autres le 10) ni s'il y aura en plus une avant-première. C'est quoi le "bureau de Johnny"? Je savais pas que les acteurs ont un bureau. Sûrement dans sa société de production ou chez son agent. Des images inédites dans celui-ci ! Sometimes Hollywood seems like the smallest place on earth. If you've ever seen celebrities backslapping on the red carpet or even sat through a season of Entourage, you might conclude that everyone in the movie business knows everyone else. Take Johnny Depp and Angelina Jolie. Between them, they've made 70 films. They own homes within an hour of each other in the south of France. And they both live with actors, which you'd think would expand their A-list circles further. But it wasn't until last November that the costars of The Tourist actually met. "We're both not that social," says Jolie. "I don't think either one of us goes out of our house, especially in France. We're both locked away." 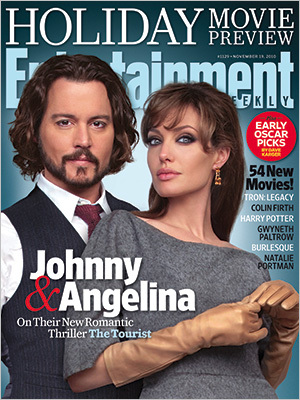 Adds Depp: "So much has been written about Angie and Brad. They're sort of the Elizabeth Taylor and Richard Burton of our era. I knew she was a big star, but I didn't know what to expect..."
We take for granted that if two movie stars are big enough--and beautiful enough--they will have instant chemistry on screen. And when the PG-13 romantic thriller hits theaters on Dec. 10, the world will find out whether Depp and Jolie--arguably the biggest male and female stars on the planet--will have that indefinable spark. Until then, though, there's a story worth sharing. The story of how Angie met Johnny. As with most $100 million-plus Hollywood productions, The Tourist took a byzantine path to theaters. It began in 2005 with a French film called Anthony Zimmer--a Hitchcockian import starring Sophie Marceau and Yvan Attal that barely made a ripple on this side of the Atlantic. Still, the pretzel-like wrong-man thriller about a money launderer on the run from detectives and Russian mobsters in sun-kissed Nice was fresh and clever enough for studios to think remake. Zimmer had twists, turns, and double and triple crosses, not to mention juicy parts for two major stars. In no time, Tom Cruise was said to be attached. Then Charlize Theron. Over time, a who's who of six-figure screenwriters tried to blockbusterize the story, which was now being set in Venice: Jeffrey Nachmanoff (The Day After Tomorrow), William Wheeler (The Hoax), Julian Fellowes (Gosford Park), and Christopher McQuarrie (The Usual Suspects) turned in one promising draft after another. But every time it looked as though The Tourist was headed for a green light, that light quickly turned red. Cruise backed out and went off to make other films. Then Sam Worthington was in. Until he wasn't. Just as The Tourist seemed headed for the turnaround graveyard, Jolie was in New York wrapping the stunt-heavy Salt. She remembers being black-and-blue and exhausted. "I wanted to do something that would be a great vacation for my kids," she says. "I got a phone call saying, 'Okay, the film's shooting in Venice,' and I said, 'I don't know what it is, but I'm going to say yes.'" Jolie's only half-kidding. The actress, 35, admits she's always had a sweet tooth for action thrillers and was intrigued by the story about two good-looking strangers in trouble in a picturesque European locale. But she also knew the script needed work--a lot of work. It also needed a director, a producer, and a leading man. Still, her mind kept drifting back to a working vacation on the canals of Venice. There are worse places to spend a few months, she thought. YOU WOULD NEVER think it thumbing through the tabloids at the supermarket checkout line, where Jolie and Brad Pitt's globe-trotting exploits are chronicled the way NORAD tracks heat-seeking missiles, but the actress insists that when she and Pitt are not working, they tend to be parked in front of the TV for movie nights, with a heaping bowl of popcorn. One evening back in 2006, the couple put on a yet-to-be-released German film called The Lives of Others--the feature debut of a 32-year-old director from Munich named Florian Henckel von Donnersmarck. The film, which tells the tense, claustrophobic story of an East German spy, would go on to win the Oscar for Best Foreign Language Film. But before its long march to the Kodak Theatre, Jolie and Pitt sat in front of the TV, entranced. "Brad and I watched it together and we loved it," recalls Jolie. "The character work, all the small details, you really had to lean in and watch. It was handled with such precision and delicacy, and very few films are today." Pitt sent a gushing letter to the director and fired up a long-distance friendship. He wasn't the only admirer. Seemingly overnight, Henckel von Donnersmarck was meeting with smitten studio execs in L.A. "It was overwhelming," says the director. "If you make a film for $2 million that makes $80 million worldwide, those are numbers that Hollywood responds to. No one wanted to distribute The Lives of Others. And going from that to being offered all these Hollywood scripts, you're like a lobster being cooked alive. I remember thinking, 'Do I just jump at an opportunity because it's there?'" Henckel von Donnersmarck, whose name is actually short for the even-more-unwieldy-and-Teutonic Florian Maria Georg Christian Graf Henckel von Donnersmarck, wasn't sure he was ready to become the next Roland Emmerich--the big-budget German auteur of Tinseltown schlock like 10,000 BC. He says he passed on "dozens" of offers, opting instead to hammer out a script of his own despite the concern that he was making a colossal mistake. Then, just as he finished his screenplay, he got a call from Jolie. Would he meet her in Los Angeles? Pitt arrived with Jolie to make the introductions, then left his better half to talk business. Jolie pitched the director on The Tourist--how she saw it as a suave cat-and-mouse thriller, like a modern-day To Catch a Thief or Charade; how she was convinced it could still feel smart and European despite its rich price tag; and how it also needed a lot of overhauling. "She was still a little undecided about it and she said, 'Look, what do you think? If you wanted to do it, I'd be interested,'" recalls the director. "I found myself apologizing that it wasn't The Lives of Others," adds Jolie. "It doesn't have that importance or depth. And he talked about how something that's a pleasure to watch can be just as important." Henckel von Donnersmarck left the meeting knowing he would not only direct the film but rewrite it, too. Jolie and Henckel von Donnersmarck then brought The Tourist to Graham King, an English-born L.A. transplant with a gruff London accent and a fast-rising reputation as a rainmaking producer of ambitious, star-driven films like The Departed and The Aviator. As luck would have it, King mentioned to them he had a dinner date with Johnny Depp the following week. And just like that, three lightbulbs simultaneously went on. At dinner King turned to Depp and said, "Before you do Pirates 4, are you interested in going to work?" Depp was intrigued. King sent the actor the script--or at least the cobbled-together mishmash of all the previous scripts. Depp called back a week later. He was in. The only problem was The Tourist would have to be rewritten, shot, and wrapped in the next five months so Depp could jet off to Hawaii and slather on Captain Jack's mascara. If they'd stopped and thought about it, King says they probably would've talked themselves out of making the movie. But he also knew that sometimes it's best not to think. "When I read the script, I thought, 'Hmmm, there's quite a bit missing here,'" says Depp, 47. "We need to dissect this f---er and see what we can throw in there." Depp liked the idea of inhabiting an Everyman character like the Midwestern math teacher he plays in the film--a regular Joe who goes to Europe for an adventure and finds one on a train after meeting a stunning mystery woman who's being tailed by the police and a gang of Russian goons. After all, Depp had seen Anthony Zimmer years earlier and loved it. Plus, there was another reason for doing the film: the chance to finally meet an actress he'd long admired. FOR THOSE WHO WATCH THEM, movies are simple diversions. But for those whose business is making them, they're complex machines with lots of unpredictable moving parts. One of the biggest question marks on The Tourist was whether Depp and Jolie would have chemistry when they met. Each of the actors had been a fan of the other: Depp had been floored by Jolie's go-for-broke performance in The Changeling; Jolie had long been a fan of Depp's and later admitted she'd watched his Mad Hatter in Alice in Wonderland over and over with her six children. On Nov. 24, 2009, less than three months before the two stars would fly to Venice and start a complicated love affair on camera, King and Henckel von Donnersmarck set up an introduction for them at Depp's office in West Hollywood. Jolie and the director got there first. Henckel von Donnersmarck, playing a sort of millionaire matchmaker, quickly plopped himself in Depp's chair so the two stars would be forced to sit side by side on the sofa. Jolie paced around Depp's office trying to take the measure of her costar before laying eyes on him. "As I was waiting, I noticed these beautiful pictures of his [girlfriend, actress Vanessa Paradis] and kids and all of his paintings," remembers Jolie. "He's an artist, and you feel that in any space he's in. When he walked in, he was as interesting as I'd hoped he'd be." When asked if she was nervous going into the meeting, Jolie pauses for a minute, then replies, "Maybe." When Depp is asked the same question, he laughs. "Well, there is sort of that. Because on one level it's like, 'Here we go, kid. We're about to get into the ring together.' We sat there and babbled about our kids, and it was a huuuuuge relief. I was pleasantly surprised that she has an incredibly perverse sense of humor. She's a really cool broad." Halfway through the meeting, a bottle of wine was uncorked. And by the time it was over, everyone got in their cars, drove their separate ways, and exhaled. Six weeks later, Depp and Jolie landed in Venice to start shooting. They couldn't believe the film was actually happening. "I think we all kept thinking it was going to fall apart any second just because it all happened so quickly," says Jolie. Henckel von Donnersmarck showed his stars the still-wet pages of his rewrite as the cameras began to roll. They'd have to learn their lines on the fly. Fortunately, Depp and Jolie shared similar acting styles--no small concern considering that Depp loves to ad-lib and basically refuses to rehearse or pay attention to stage directions in the script. Jolie wasn't just okay with Depp's merry-prankster improvisations--she gave as good as she got. "I could throw her anything and I would expect a great toss-back," says Depp. "Or I'd do a scene and she'd slap me with something and you run with that. We had a ball!" ACTUALLY, the only problem on the set was the one that could have been most easily predicted by pairing two of the world's boldest boldface names. "I remember standing on a bridge by the Grand Canal one morning and Johnny and Angelina were coming to the set on their boats, and behind them was a fleet of paparazzi on their boats," says King. "It was a nightmare." He says they improvised an elaborate system of decoys and obstructions to frustrate aggressive photographers and keep them at bay. "I remember freaking out the first week of shooting, thinking, 'How are we going to keep this movie from the press?'" says King. "But in today's world there's a lot you can do with greenscreen. You can put up a black tent and fill it in later." Later is now finally here. Nearly a year after The Tourist's harried and hurried journey began, Depp is off in warmer climes flashing his rum-sozzled gold teeth for May's Pirates of the Caribbean: On Stranger Tides, and Jolie is in Budapest directing an as-yet-untitled Bosnian-war drama--her first gig on the other side of the camera. For both stars, the charming canals of Venice and their awkward first shotgun rendezvous are distant memories. Meanwhile, Henckel von Donnersmark is stuck in L.A., tweaking, tinkering, and praying that the moment when Angie met Johnny is as memorable on celluloid as it was in the flesh. "At the end of the day, whether people will accept the movie or find it too European, that's out of my hands," says the director. "If they don't, it might make it tough for me to direct The Tourist 2 or Superman, but I won't be in a worse position than before I made The Lives of Others." As for Depp and Jolie, something tells us they'll be just fine. Merci, c'est très interessant! A première vue il semble qu'il y a une forte admiration entre les deux. Merci beaucouup! Il joue le suspens. Et merci beaucoup pour l'article!! Oui tu as raison Chiara, 2 grands acteurs. Je pense que le mélange va être intéressant! Et qu'est ce qu'ils racontent, en résumé ? Mais merci quand même Ludi . Je vous fais un résumé demain si vous pouvez attendre. Oui c'est pas urgent Ludi.